Tenali Ramakrishna, the famous poet, humorist and philosopher, from the state of Andhra Pradesh once happened to lose his way while traversing an area of thick jungle. He lived in the reign of the famous Emperor Krishnadeva Raya, of the Vijayanagara Dynasty, about 1500 AD. He was attached to the Court and was honoured as a wise and quick-witted minister. While he was wandering desperately in the jungle, he saw an old sage. Ramakrishna ran forward and fell at his feet, in reverential homage. He asked the sage, how he had become caught in that wild forest. The sage said, “The same Mysterious Force that dragged you here has dragged me too to this spot. The moment when I have to cast away the body which I have occupied so long, has arrived! I shall initiate you, now, into the manthra (sacred hymn) which I have recited all these years as my talisman and treasure.” It was the Manthra of Mother Goddess Kali, and he whispered it into the ear of Ramakrishna. Ramakrishna was overjoyed at the great gift. He retired into a temple of the Mother, deep in the recesses of the jungle and was intent on the meditation of the Mother, propitiated by the manthra. 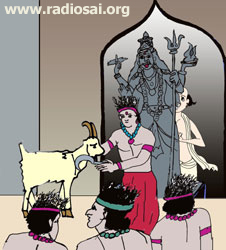 At midnight one day, the aboriginal Koyas of the forest came into the temple with a goat which they sought to offer as sacrifice to please Her and propitiate Her. Ramakrishna hid behind the idol and when the knife was about to fall on the neck of the victim, he exclaimed, “I am the Mother of all living beings, including you. If you kill my child, I will curse you, I cannot bless you!” Believing that it was Kali who spoke, the Koyas desisted and went away. 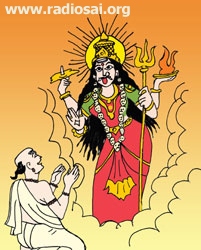 Now, Kali manifested before Ramakrishna. She asked him what he would like to receive from Her! She was pleased with his Sadhana (spiritual practice). “Which do you want?” she queried, holding a plate of curds-rice in one hand and a plate of milk-rice in another. He wanted to know the consequences of eating either plate before deciding which plate to ask for. She laughed and said, “How can I describe the taste and make you understand the difference? You will have to taste them yourself,” and gave him both the plates, for that purpose. 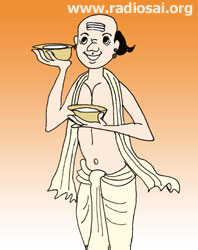 The clever Ramakrishna hastily put them both in his mouth and managed to swallow the curds and the milk, the entire quantity of rice from both plates! Kali was indignant and exclaimed that his impertinence called for dire punishment. 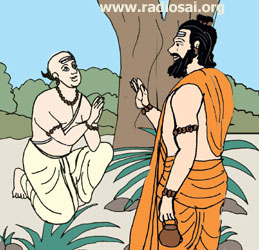 Ramakrishna accepted his mistake and invited the punishment she proposed to inflict. But can the Mother’s punishment destroy the child, however reprehensible the conduct of the child may be? “My sentence will certainly save you, do not tremble,” said Kali. God loves those who have self-confidence and the courage of their convictions and who seize every opportunity to improve their spiritual status.